September is back to school time so let’s go back to the basics of vocal care with one of my most popular posts. 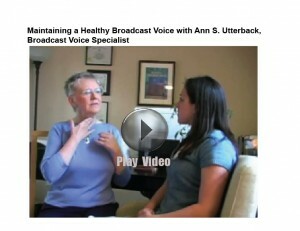 Keeping voices healthy has always been one of my primary goals as a voice specialist. Recently I got a Twitter message from a guy who says that long narrations are tough for him. I promised to send along some tips to help him endure long stints in front of the microphone. I had the pleasure of doing an interview for the International Journalists’ Network a while back, and their video seems a good starting point. In this video I explain the dangers of smoking and the importance of hydration for a healthy voice. These are the first two basic things you should know about vocal health. You can read more about the importance of fluids for the throat by clicking here. Once you have taken care of the first two items, I suggest you work on your breathing to improve breath support for long narrations. I actually have another video you can watch that will help you with that. For the video on breathing, click here. So for my Twitter friend, I suggest tackling these three areas to make those long narrations less grueling. They might not make the pages of copy fly by faster, but they will keep your voice healthier, and you will feel more relaxed! The fifth edition of BROADCAST VOICE HANDBOOK has lots more on how to keep your voice healthy. Check it out by clicking here. Next post: Yawning for a Better Broadcast?